Alicia Keys (born Alicia Augello Cook on January 25, 1981 in Manhattan, New York) is an American R&B and soul singer, songwriter, record producer, and pianist. Alicia was born to an Irish-Italian mother, Terri Augello, and a Jamaican father, Craig Cook, and was raised in the Hell's Kitchen neighborhood of New York City. Her maternal grandmother is Puerto Rican. Keys began playing piano when she was seven. She learned classical music by playing composers such as Beethoven, Mozart, and Chopin, who was her favorite composer. She wrote her first song "Butterflyz" at the age of fourteen; the song can be found on her debut album. Keys' mother was the one who most supported her during the time she was developing her talents. Keys' mother and father seperated during her early childhood, thus she was raised by her mother during her formative years. However, Keys has now reconciled her relationship with her father. Keys graduated as valedictorian from the Professional Performing Arts School, a public high school in Manhattan at the age of sixteen. She briefly attended Columbia University on a scholarship before devoting herself to a full-time musical career. Following her mentor Clive Davis to his newly-formed J Records label, she released her debut album Songs in A Minor in 2001, the title being a reference to both her classical aspirations and to the fact that she wrote most of the songs at a very young age. Alicia burst onto the music scene in June 2001 with her debut release Songs In A Minor on Clive Davis’ J Records. Songs in A Minor was a commercially successful album when it debuted at #1 on the Billboard 200 selling over 235,000 copies in its first week and going on to sell more than 10 million units worldwide symbolizing the international impact she has as an artist. . Its first single "Fallin'" was a huge hit as well, gaining airplay on many different radio formats and spending six weeks at #1 on the Billboard Hot 100. Keys also gained visibility with her resolute performance of Donny Hathaway's "Someday We'll All Be Free" at the America: A Tribute to Heroes televised benefit concert following the September 11, 2001 terrorist attacks. A subsequent single, "A Woman's Worth", made the Top 10 as well. With the album she won five Grammy Awards in 2002, including Best New Artist and Song of the Year for "Fallin'". Because she wrote her own songs and played several instruments very well, consumers saw Keys as an original voice at a time when the musical marketplace was flooded with pop bands that were little more than an attractive front for the creative energies of others. As such, she established a large fanbase of devoted fans, making her one of the most popular artists of the early years of the 21st century. Critical reviews were mostly positive. Keys' work had a sound similar to 1970s soul singers such as Curtis Mayfield and Marvin Gaye along with hip hop influences like those apparent in neo soul artists such as Lauryn Hill, Erykah Badu, and D'Angelo. However some critics went further by accusing her of outright plagiarism, especially in the case of her single "Fallin'", which interpolates James Brown's "It's A Man's World" right down to the string arrangement. 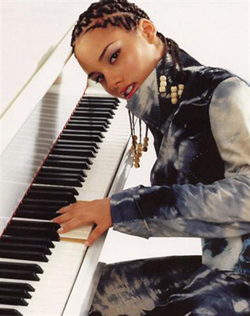 After relentless touring, Alicia followed up her successful debut with The Diary of Alicia Keys, released in December 2003. The album was hailed by critics and debuted at #1 selling over 618,000 copies its first week of release in the United States. The Diary of Alicia Keys is currently 7 times platinum worldwide. "You Don't Know My Name" and the soulful "If I Ain't Got You" both became Top 5 hit singles, with the later "Karma" also receiving considerable attention. At the 2004 MTV Video Music Awards Keys led Lenny Kravitz and Stevie Wonder in a stomping rave-up of Wonder's "Higher Ground". At the 2005 Grammy Awards, she gave a powerful performance of the album's second single, "If I Ain't Got You", and then joined Jamie Foxx and Quincy Jones in a stirring rendition of "Georgia On My Mind", the Hoagy Carmichael song made famous by the late Ray Charles. That night she went home with four Grammy Awards (Best R&B Album for The Diary of Alicia Keys; Best Female R&B Vocal Performance for "If I Ain't Got You"; Best R&B Song for "You Don't Know My Name"; and Best R&B Performance by a Duo or Group with Vocals for "My Boo" with Usher). Keys performed and taped her installment of the " MTV Unplugged" series in July at the Brooklyn Academy of Music, which is due for a release on CD and DVD. During this live session, Keys added brand-new arrangements to her original songs such as "A Woman's Worth" and "Heartburn," and performed a few choice covers. Part of Keys' audience also included her guest performers, she collaborated with several top acts such as rappers Common and Mos Def for "Love It or Leave It Alone," reggae artist Damian Marley for "Welcome to Jam Rock" and Maroon 5 lead singer Adam Levine for a cover of the Rolling Stones' "Wild Horses." In addition to a cover of "Every Little Bit Hurts," previously performed by female greats like Aretha Franklin and Brenda Holloway, Keys also unveiled two new original songs: "Stolen Moments", which she co-wrote with soul legend Al Green, and "Unbreakable." Keys' "MTV Unplugged" album is due Oct. 11, 2005 via J Records.The set will be led by the new single "Unbreakable," which will impact U.S. radio outlets on Sept. 12.